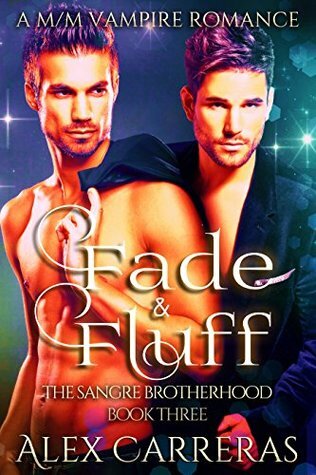 Fade & Fluff Review ~ Romantic Comedy with vamps … 8 out of 10! Cover Art: A blue and green background complement the handsome men on the cover. Two men look outward, the one on the left has a bare torso with his black shirt slung over his left shoulder, the man on the right has on a dark blazer with no shirt. Title font is large and legible, author’s name is at the bottom in a bold, white font. Synopsis: The information given lets you know who the main characters for the last book will be. For those who have read the first two books in the series, this ends a fun, action, romance series for vamps. There is not a warning of sexual content. Plot: This book is Jerrod and Kairon’s story. They were together for a long time, long ago. Kairon still loves Jerrod. Both groups of vamps, from the salon and the barbershop thought they had killed Alderman. Life for a vamp is more than they anticipate. Kairon- barbershop owner across the street from the salon, a vamp, and Jerrod’s ex. Secondary Characters: Your favorite vamps from the first two books are here to keep the action and laughter going. Flow/Continuity: The intimate scenes fit the story, as do the heated moments. Conflict & Climax: The fighting and making up are both intense. I’m not sure who is more stubborn in this vamp’s circle. Editing/Formatting: Both are well done. Priced: The price is reasonably low, however this is a rerelease although the storyline has been added to. Conclusion: This is a romantic M/M Vamp comedy with action. I read the original series and with each story being added to and polished, it makes you want the new releases. While the series ends, you almost expect more. The series is available to purchase in a grouping. Sangre Trilogy: Buzz & Blow, Shave & Shimmer, Fade & Fluff. Previous Reunion Review & Blitz ~ Heartwarming story … 9 out of 10! Next Omega’s Claim Review ~ Met all the expectations … 9 out of 10!